When standard pneumatic components don’t meet your equipment specifications, contact Pneumadyne to discuss a custom solution. Our engineers will take the time to understand your application requirements and recommend components or systems that best fit your needs. We will work closely with you from design through production to ensure that you receive the function you need and the quality you expect. Our knowledge and expertise in fluid power and precision machining is an advantage when developing components for use in packaging equipment. Various pneumatic components can often be consolidated into a valve block or manifold system that is easy to install, saving you assembly time and money. Integrated designs also eliminate potential leak points and improve overall circuit appearance. To ensure that your specific requirements are met, contact Pneumadyne engineers to discuss a custom solution. Pneumadyne manufactures a wide variety of rugged pneumatic components that are suitable for use in packaging equipment. 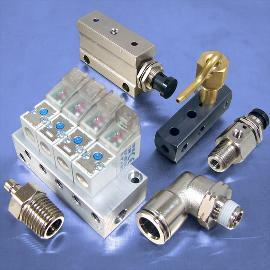 Our directional valves feature numerous porting options, sizes and configurations to accommodate plumbing requirements. Push-to-Connect, Barbed and Threaded fittings are available to easily connect the pneumatic components within your application. Pneumadyne solenoid valves are offered with a variety of connector, voltage and flow rate options to fit circuit specifications. Our brass air nozzles are ideal for directing air towards a specific location within any pneumatic application; ideal for the removal of dust and dirt. The following components represent some of our most commonly used products. Review our full catalog offering by clicking on the top navigation (in the gray bar).